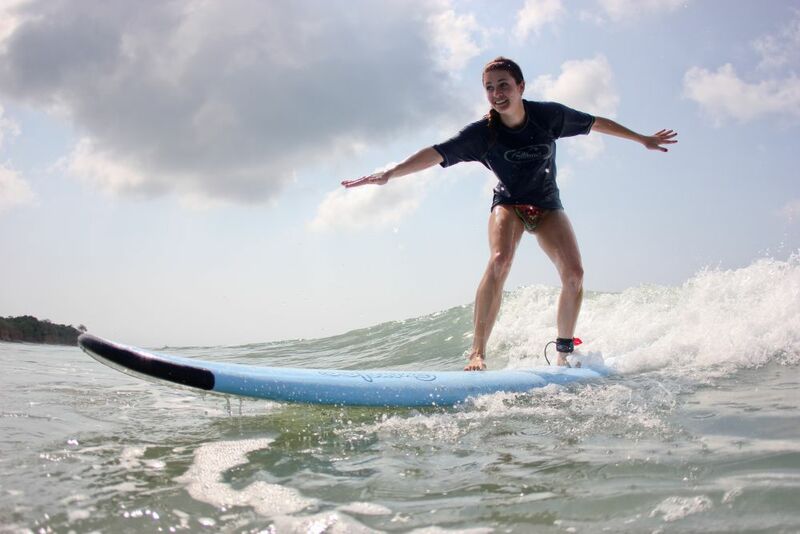 StarSurfCamps - Surfing Holiday Adventure in Mexico! Ops! Potresti aver dimenticato qualcosa. Richiesta inviata! Ti ringraziamo e ci impegniamo a rispondere il prima possibile. ¡Bienvenidos a México! 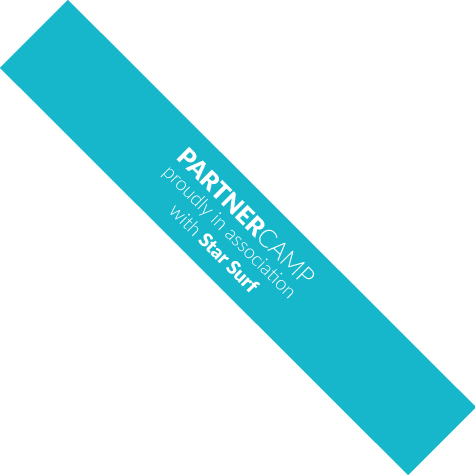 Join Star Surf Camps on a great adventure to the heartland of the former Aztec Empire, a fabulous surf trip all about learning to surf and improving existing surf skills with our amazing partner camp. Enjoy daily surf and SUP lessons and explore some of Mexico’s most beautiful surf spots during our exciting, one week surf adventure! Mild temperatures and warm waters all year round make Mexico’s West coast the idyllic wintery escape or sunny summer getaway. 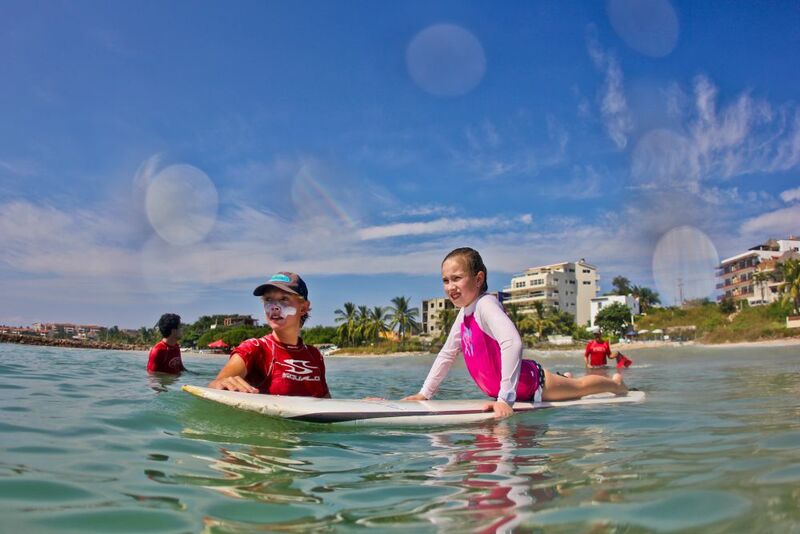 Our surf trip is perfectly suited for young adventurers who, in traditional Star Surf Camps’ fashion, want to share the magic of surfing in great company of like-minded travellers! Our surf and SUP trip to Mexico takes you to our lovely partner camp in Sayulita. Located along a picture-perfect 300-kilometer-long coastal strip on Mexico’s West coast, the beautiful area of Riviera Nayarit offers fantastic waves for every ability level of surfing and SUPing! Located on the Pacific coast, among the monumental mountains of the Sierra Madre Occidental, lies one of Mexico’s most beautiful coastal regions, the Riviera Nayarit. A 300-kilometer-long coastline, nestling between beautiful coral islands and a majestic jungle, offers an abundance of surf and SUP spots. The conditions in the water are great for first-time surfers and SUPers as well as for those looking to improve their existing surf or SUP skills. And with our qualified team of international instructors, expert local surf guides and experienced surf coaches, you can be sure to be in good hands! Here in Mexico, we’re all about teaching the essential skills of surfing and taking your surfing to the next level! During your week with us, you’ll receive expert tuition daily, meet like-minded travellers from all over the world, make new friends for life, experience a fascinating culture and surf the best waves of your life! In Sayulita, you can choose from two lovely surf camp accommodations. Live and surf in comfort, and experience a great variety of waves all just a stone’s throw away from your home away from home! And after a day’s surfing or SUPing, relax and socialise in your surf accommodation around the swimming pool, talking story before heading out for some delicious Mexican Quesadillas and a great night out partying! Based in the charming town of Sayulita, our two lovely surf accommodations provide the perfect base for your surf adventure! In our first accommodation, an authentic Mexican-style hostel, you’ll spend your week in Mexico in comfort. Here, all rooms are classic dorms (mixed and female only dorms available on request) with bunk beds, perfectly suited for groups and single travellers on a budget. Each dorm has a fan and private lockers with plenty of storage space for your belongings, and each bed comes with bed linens, a reading lamp, a bookshelf and a plug. There are several shared bathroom and shower facilities on every level, on-site laundry facilities and the communal areas include a fully equipped kitchen as well as a lounge area with a flat screen TV and Wi-Fi. Use the time between surf sessions to relax on the spacious terrace or in the hammocks by the swimming pool and conquer the outdoor climbing wall before heading out into town. 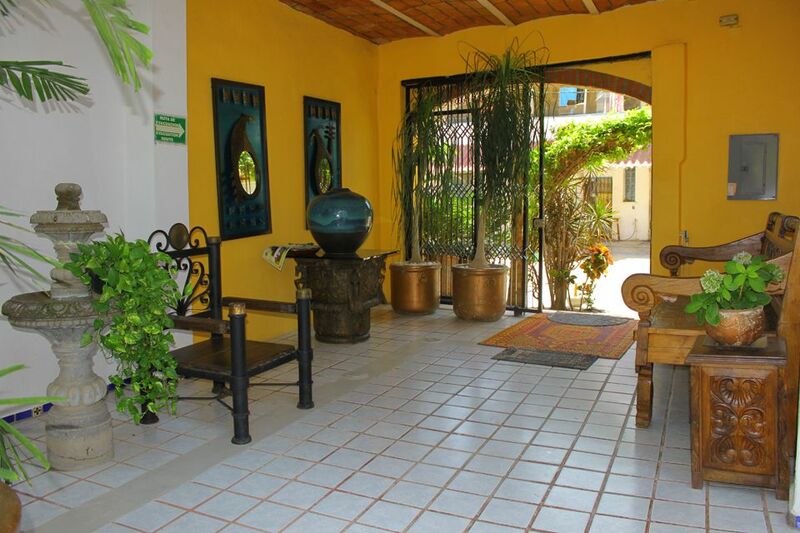 Located right in the heart of the lively city centre of Sayulita, with multiple local shops, restaurants, Cafés and bars nearby, our surf hostel is super central, comfortable, clean and affordable! Please note that our hostel option does not include any meals. There are, however, several snack shacks, convenience stores and plenty of wonderful restaurants just a stroll from your doorstep. Our second accommodation is a charming beach-style hotel. 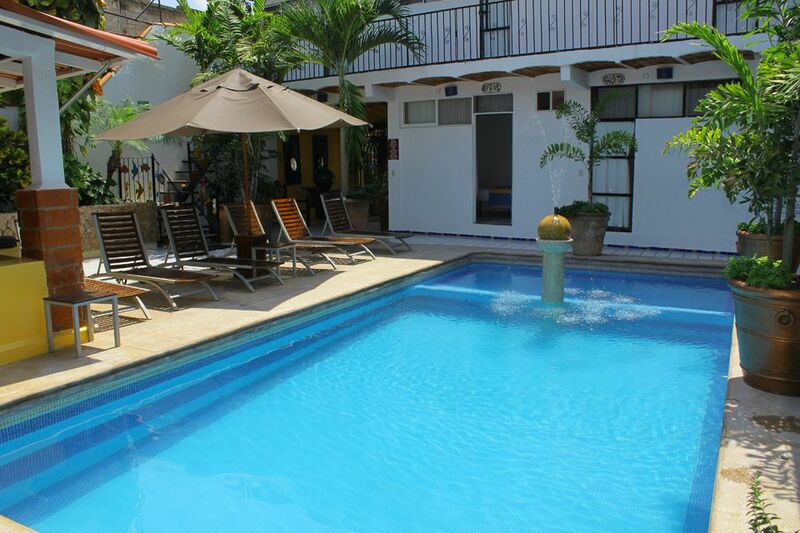 Located in a quieter part of town, you’re only a stone’s throw away from Sayulita’s beautiful coastline. Here, all our carefully decorated twin and double rooms come with en-suite bathrooms, free Wi-Fi, A/Cs, bed linens and bath towels. The communal area includes a kitchen, a breakfast or dining room as well as a comfortable lounge area. Start your early morning indulging in a delicious Mexican breakfast, and after an exciting day in the water, spend your afternoon relaxing in one of many sun loungers by the pool and your evening watching the sunset in one of many beach bars close by! Included in the price of your stay is a healthy, varied and delicious daily breakfast but we do not include lunch or evening meals as we highly recommend trying the amazing restaurants in town or at the surf spots we visit. The lively city centre is only a short walk away and offers multiple traditional Mexican restaurants, local shops and authentic bars. 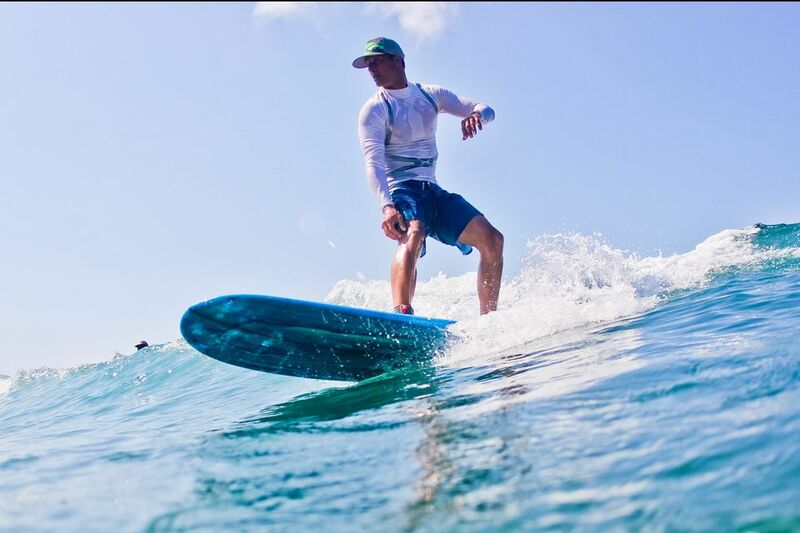 Our Mexico surf trip is perfectly suited for beginning to intermediate surf abilities. Here, we introduce you to everything you need to know about surfing, from surf theory to the true surfer slang (what are “swells”, “barrels”, “tubes”, “green water waves”, etc.) to the best warm up techniques and, of course, how to stand up on your board! For your surf lessons, we meet at our headquarters in the centre of town. To ensure you’ll get to surf the best waves suited to your ability level, we usually divide our group, and with multiple surf spots close by, our local guides and instructors find great waves for you every day! And there’s more: Among the highlights of your surf trip are our three adventures to secluded surf spots on the beautiful coral island which are accessible only by boat! Of course, all transports and surf equipment (boards, leashes and wetsuits) for your surf lessons are included in the price. In Mexico, we have a huge variety of beginner and advanced surfboards of all shapes and sizes. During your week’s holiday with us, our services include all exchanges of surfboards for different shaped or sized ones in order for you to maximize your surf experience and to get the chance ride a wide range of surfboards during your stay. Our expert surfers are at hand to help you with any questions you might have! The Mexico trip is perfectly suited for SUP beginners and intermediates. We start our SUP lessons from our headquarters in the centre of town. From here, we head out in smaller groups of different ability levels to ensure you get to paddle among your favourite waves. With multiple SUP locations close by, our local guides and instructors find great waves and beautiful sites for you every day! Among the highlights of our SUP tour are our three fantastic excursions to the beautiful lagoons on the coral islands just off the coast of Riviera Nayarit where you get to admire the marine life as you glide over these turquoise waters! Mexico’s mile-long coastlines offer the perfect setting for all sorts of SUP adventure! Of course, all transports and SUP equipment (boards, paddles, leashes and wetsuits) for your lessons are include in the price. In Mexico, we have great selection of SUP boards. During your week’s holiday with us, our services include all exchanges of boards for different shaped or sized ones in order for you to maximize your SUP experience. Our experts are at hand to help you with any questions you might have! Of course, all transports and surf equipment (boards, leashes and wetsuits) for your surf lessons are included in the price. Airport transfers are not included in the price. However, we can arrange for your transportation to your surf accommodation for only $130 (return). For an informal inquiry, please contact one of our staff. In Mexico, we can arrange for all sorts of extra fun activities from snorkelling adventures and outings on horseback to going fishing or whale watching. For an informal inquiry on activities around the Sayulita are, please contact one of our staff. Il sito utilizza "cookie" per fornirti un' esperienza di navigazione il più piacevole ed efficiente possibile. Continuando a utilizzare il sito dichiari tacitamente di accettare l'utilizzo di "cookie".